I visited Spring Grove yesterday and observed numerous males making their low-level flights in search of females. While there are multiple species of bees representing a number of families that create individual (solitary) burrows in the soil, there is a high probability that burrowing bees found in Ohio belong to the genus Andrena (family Andrenidae) with over 100 species living in our state. Many of these species have prominent banding on their abdomens which is even visible in flight. These native pollinators are typically 3/16 - 3/4" long depending on the species. Females dig individual burrows several inches deep into the soil. They prefer to nest in well-drained soil that is lightly exposed to sunlight. This includes areas in landscaping with sparse vegetation such as openings created by weakened turfgrass. The females become receptive to mating after they provision their burrows with wads of pollen mixed with nectar to nourish their larvae. You can observe receptive females peering from their burrows. If you keep watching, you will observe one or more males clamoring around burrow entrances intent on getting acquainted with a female which commonly leads to a mating scrum … at which point you should look away. Mated females deposit multiple eggs in their burrows and the resulting larvae feed and develop on the pollen/nectar banquet provided by the females. Winter is spent as pupae in the burrows with adults emerging in the spring to start a new round of bees. I observed something in Spring Grove that I've never seen before. There were numerous conical-shaped holes dug throughout one of the largest mining bee colonies. The holes were much larger than those created by the bees and I'm not sure of the culprit but speculate it could be evidence that skunks or raccoons were searching for a bee morsel meal. Mining bees are important polylectic plant pollinators meaning they gather pollen from many different plants. They are particularly important for pollinating spring blooming food crops including apples, cherries, and blueberries. However, the low-level flight plans by the males may be frightening to the unenlightened. While the females are busily digging and provisioning their burrows, the pugnacious males cruise menacingly back and forth just above the soil chasing other males or possible predators. It's all a rouse because the males lack stingers (= ovipositors). 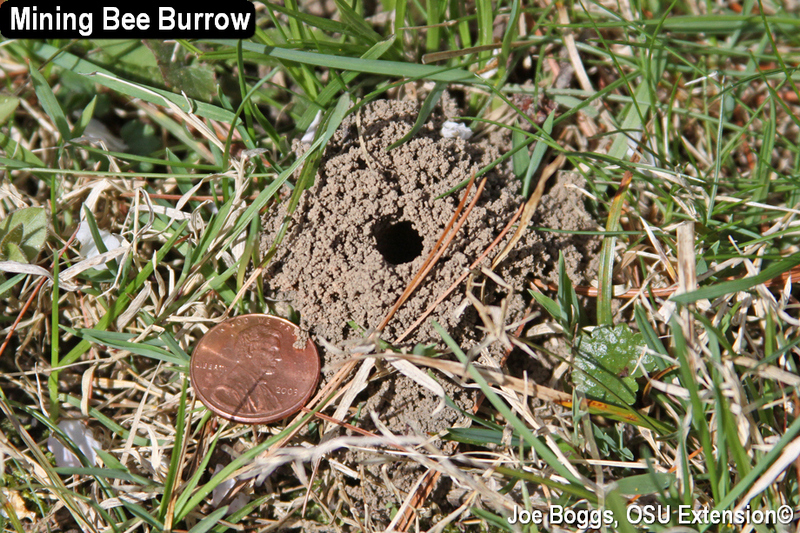 Solitary soil burrowing bees, including mining bees, are not aggressive. You would almost need to try to get stung, to get stung. Even then, stings from these bees don't pack much of a punch; their small stingers can't penetrate far into the skin. Unfortunately, large numbers of bees buzzing around at knee-height may trigger fear in the uninitiated prompting ill-advised efforts to eliminate these beneficial insects including applications of insecticides. This practice should be strongly discouraged. Instead, cultivation practices aimed at thickening turfgrass will convince the bees to burrow elsewhere. Fortunately, fear of these highly beneficial insects may be calmed through education. In a proactive educational approach to calming fears, Dalton places signs over the bee colonies explaining to visitors exactly what is happening with these beneficial bees. Included on the sign is a list of plants that will support these helpful pollinators; a sign of good environmental stewardship!